A collection of tasting notes of wood barrel coopered spirits. Whisky, bourbon, Scotch, Irish, Canadian, Cognac, Brandy, and Rye. Sometimes with a dash of history. 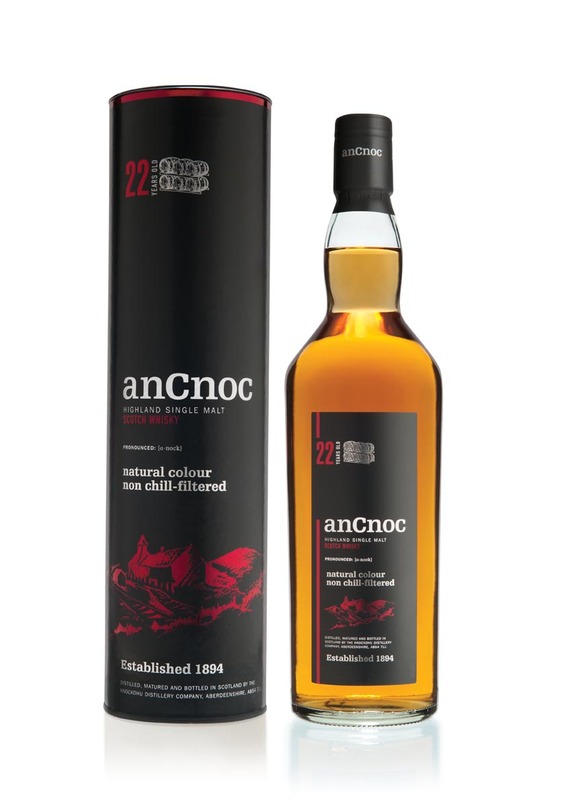 anCnoc - formerly Knockdu, was a cutting edge distillery built in 1894 at the tail end of the late 19th century whisky boom and one of the casualties of the 1983 slaughter of distilleries. Its location Knock, Aberdeenshire, is sometimes reckoned as part of Speyside, and sometimes as Eastern Highlands - not that this particularly matters. It was picked up and reopened half a decade after the 1983 closure by Inver House (makers of one of my least favorite blends) but appeared on the American scene only the past decade, under ownership of Pacific Spirits. This distillery was certainly off my radar until the past few years. Apparently the name was changed to avoid ongoing confusion with the unrelated Knockando (which certainly was on my radar - even as long as 20 years ago). 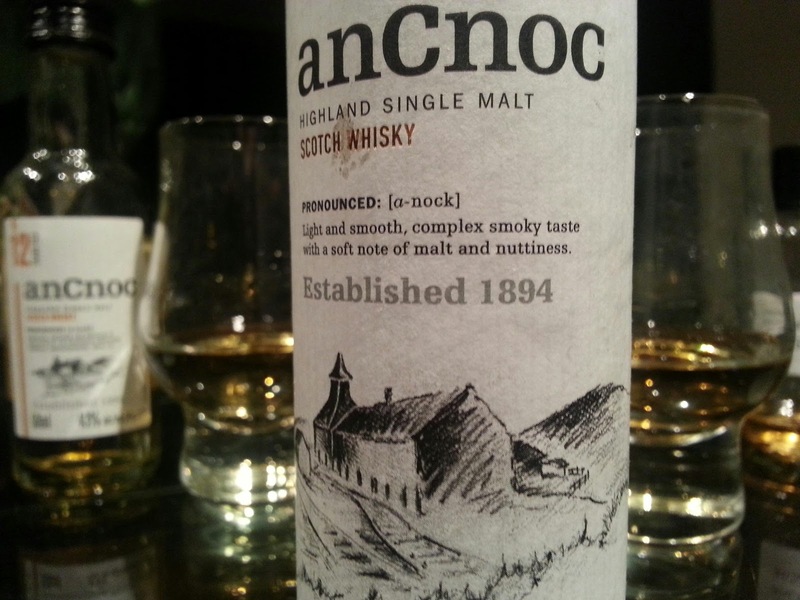 Well, anCnoc has become, along with Balblair, the standard bearer of the light, tart, "green apple" floral Highland flavor profile. 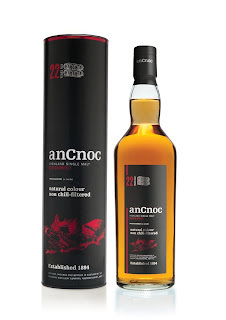 This has really become a trend in recent years and I've heard several friends say that anCnoc 12 is their new favorite base expression, unseating classic pale Highland malts such as Glenlivet 12 and Glenfiddich 12. 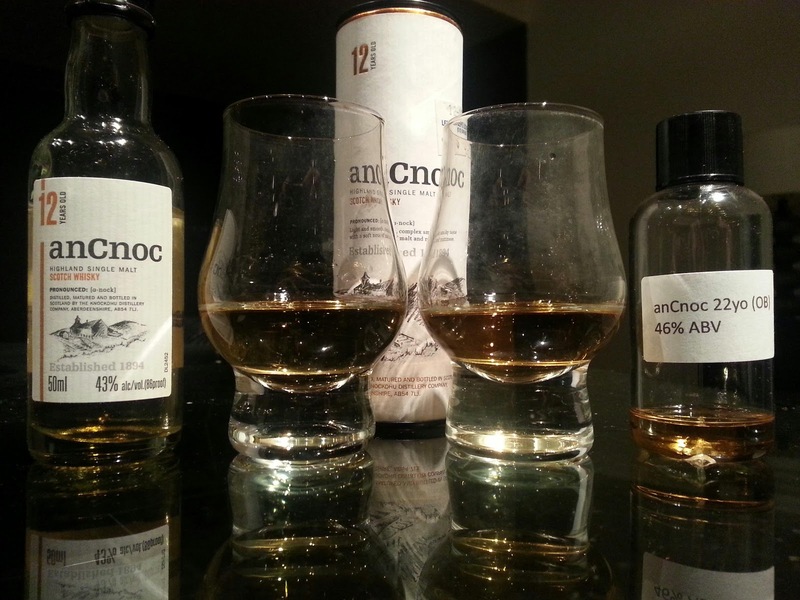 Part of the upgrading action for anCnoc is the recent Peter Arkle editions and the new 22 yo - which slots in between the traditional 16 and the rare 30 year old top expression. There are also several limited edition single year vintage bottlings: 1995,1994 and1975 that are well regarded. I'm behind the curve, so it's high time I tried the 12 and the 22. The description of the 16 and the 22 specifies that they are not chill filtered. The lack of such a specification on the 12 indicates that it is - FYI. Be aware that most reviews and sales listings for the 12 seem to be at 40% abv and the 50ml bottle I purchased at Ledger's is 43% and some of the recent reviews indicates that maybe the proof has been increased (a very good move). Nose: Heathery floral with grassy elements of sugary hay and alfalfa with some gentle flinty mineral, lightly tannic white wine, and a touch of meaty broth. The sweet hay and savory warmth almost evoke a bit of farm yard. There are some lovely green apple fruits and tart crisp apple skin and some paraffin wax. The palate opens gently with a very appealing light heathery floral perfume character. The expansion brings tasty honeyed malt and then an acidic tartness carrying green apple skin, lemon and pino grigio aspects. The finish turns malty and almost savory - very gentle and warming. Adding a drop of water ups the paraffin in the nose significantly (and deliciously) and suppresses the meat broth dramatically - improving the nose. The palate thins with water, however - becoming more tart and less sweet. I preferred it neat. This is wonderful whisky for a base expression - particularly in warm weather. Nose: Magnolia, rose and honeysuckle florals. Maybe even a touch of Jasmine blossoms on a cold morning. The floral meets a slightly tannic edge like Tung Ting jade wulong tea. Then rich honeycomb, honeydew melon and some hints of tangerine or blood orange. Underneath are some musky skins and hints of rich tropic fruits (pineapple, breadfruit, and mangosteen). Intoxicating. Yet it comes off as young and fresh - just very big. The palate entry is sweet, sharp and big with florals and waxy glory. The midpalate arrives with unexpected oak spice heat, citric acid tang, and bitter curb. There's a ton of oak lurking in this dram, but it shows up late. The turn to the finish is drying, but the finish is malty, gentle, and bitter-sweet. A few drops of water adds some richness to the mouth feel and tames the heat, adding some more honeyed melon in it's place. This very mature anCnoc is light and fruity - but sprightly and powerful as well. It wears it's age in oak spice cinnamon clove heat rather than in overtly oaky flavors or any kind of heaviness on the palate. Brilliant. It's remarkable to me how the tart green apple skin of the 12 has morphed into complex tea tannins in the 22. Esterification in the barrel over the extra decade has turned the young fruits of the 12 ripe and complex and sweeter in the 22. But both the 12 and 22 are highly recommended drams and epitomize the light and tart style of Highland Scotch whisky. Currently the 12 goes for around $40-$50 in the US - which is a good value. The 22 goes for around $130-$150 which, in the current market, seems a decent value to me as well. I'll need to check out other issues from this distillery as this is a flavor profile that suits me nicely. I finished my bottle of the 12 yo quite some time ago. My rough notes indicate that I liked it as an entry-level malt but didn't think it was anything special. I liked the 16 yo more (all ex-bourbon) than the 12, and also more than the 1994 vintage (2008 release) which I reviewed recently on the blog. The 22 does sound good. Yes, despite my brave and defiant words in my comment at the bottom of your post, I'm man enough to admit that you totally shamed me into completely changing the color scheme of my blog. Nice review. I picked up a bottle to bring back from Scotland. Perhaps we'll share a dram if you visit in September. It's interesting that Knockdhu was the first distillery ever built by DCL (prior to 1894 the company was simply buying distilleries to add to the portfolio). So essentially this was the Roseisle of its time. I guess that's the difference between then and now. In 1894, a single pair of stills was probably enough to satisfy the blends. It's actually amazing DCL was willing to sell Knockdhu while they permanently closed other distilleries they owned in 1983. I guess in 1988, Inver House must have made a considerable offer for the distillery. Good to have you back, Mr. Feldman! 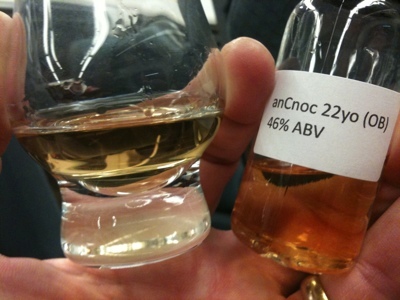 Looks like my UK sample of anCnoc 12 is 40%. I'm thinking it's 40% in the UK and 43% here, sorta like HP12 and Laphroaig 10. That's what I deserve for buying UK samples!!! Visit cooperedtot's profile on Pinterest. Is Jack Daniels a Bourbon? Charleston Brown Water Society celebrates 1 year.